I can see you already shaking your heads at the title of this post. “I don’t know how to draw” or “My spouse/partner isn’t the artsy type” or “My kids don’t have the attention span to sit and draw.” I’m kind of the poster child for learning to draw later in life. I never, ever drew until I was 29. I was raised that you came out of the womb either “creative” or “not creative.” Somehow I was considered the latter and believed that to be true until my mid-20s. Not a single art class even in middle school or high school. I was totally afraid of the failure of it. There was an unspoken belief that only a privileged few were born able to draw and the rest of us should just try Art Appreciation or something. But when I found out that I had to submit a drawing portfolio to get into graduate school in design I decided it was time to get over it already and I took my first class. I got my hands on the Betty Edward’s classic Drawing on the Right Side of the Brain. In the book she wrote something that made so much sense to me. It was about only 1% of the population ever being able to draw as well as truly gifted artists but that the rest of us could learn to draw competently with a little guidance and practice. Competent sounded achievable to me. Over the years I have learned to love drawing for pleasure and am lucky to be married to someone who, like me, packs a sketch book and pen wherever he goes. I have a sketchbook at the doctor’s office and at our daughter’s swim lessons. 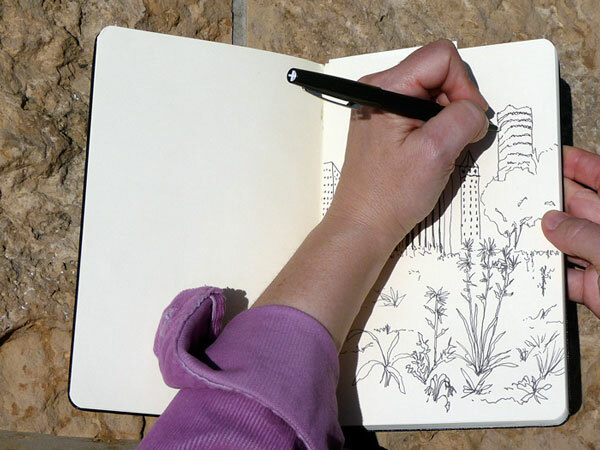 You’re never bored with a sketchbook. When our daughter turned seven we decided that it was time to set out as a family and sketch. I also wanted to sketch casually with our daughter so she wouldn’t develop the insecurities and anxiety about her drawing that plagued me when I was younger. I wanted it to be judgement-free and relaxing. 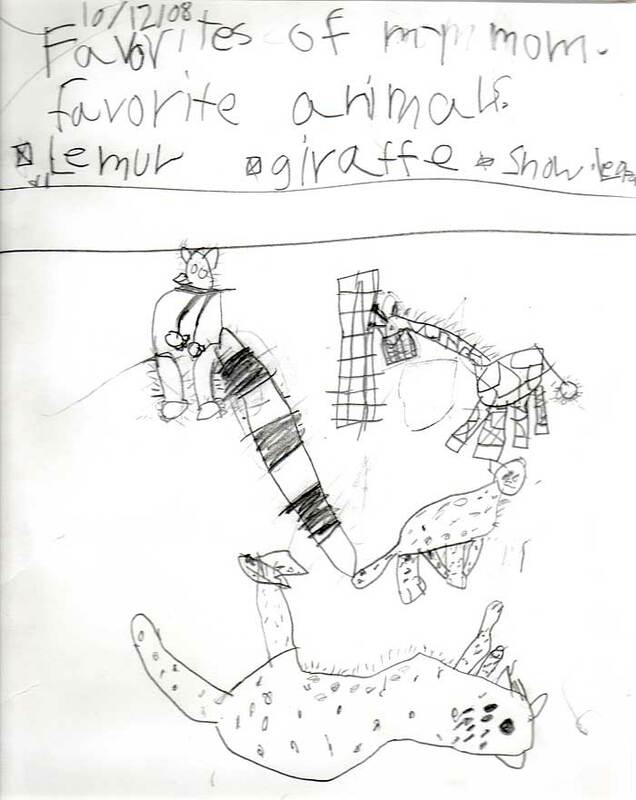 We decided that it was important to find something that would be fun for her to draw – like her favorite animals at the zoo, which she and my husband Bill sketched. Then we decided to limit the amount of time to 15-20 minutes a sketch so she wouldn’t get bored. If you have younger kids you could also introduce them to gesture drawing–quick sketches lasting only a minute or two. I love doing gesture drawing because with so little time, your brain has to do a lot of editing and you just find the most interesting thing in your view and draw that. You ignore everything else. As with most new activities with kids and adults you want your group to be well-rested, fed and have been to the bathroom before you sit down to focus on something. If you’re nervous about starting, do your first drawing in a small sketchbook, about the size of a postcard. 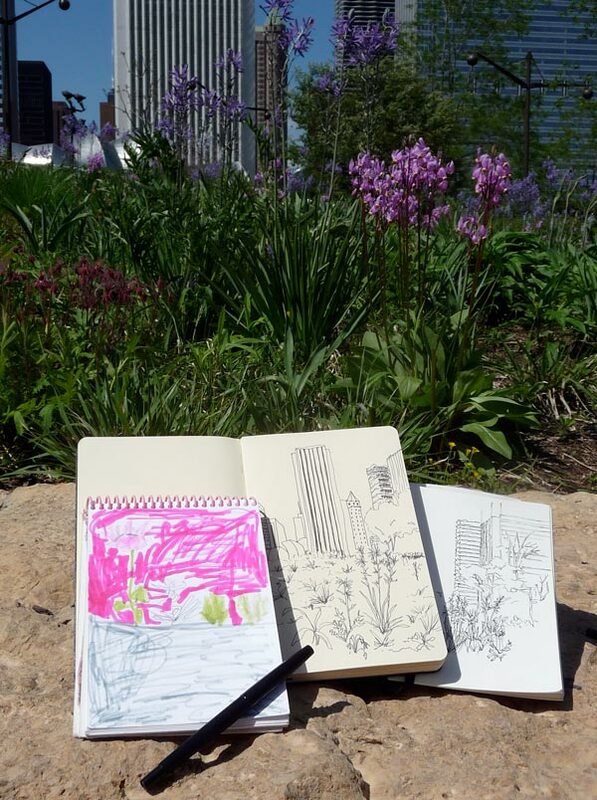 Those large sketchbooks require more time and detail than you may want to devote your first time out. So join the rest of the world and give drawing a chance on June 6, which happens to be Drawing Day 2009. Let me know how it goes. After finishing my undergrad in design I went to college for a Masters in Education. One of my teachers in grad school assigned Drawing on the Right Side of the Brain as a required book for class. I was a bit confused at first but I went along with it. She made us read it and we often drew in class. I was the only one with a design background so I though I’d have a leg up on everyone even though I didn’t draw often. I was wrong. People picked up very fast and it was a joy to see them discover that you can learn to draw. Our teacher later explained that we as teachers needed to think of all areas of education like this…. and that ALL students can learn any subject as long as you enter it with an open mind and figure out how they need to learn. Thanks for posting about this book. I hadn’t thought about my experience with it for a while! Oh my gosh. I resonated so much with this entry. I never picked up a pen to “draw” until I was about 26. I, too, believed that you were either creative or not, with nothing in between. People always considered me creative, but in my culture, artists were very much frowned on. Now I tell people that drawing is a skill that can be developed just like any skill. Yes, there will be people born with a more natural bent toward it (and the same is true of basketball, business, and singing) but that doesn’t mean we can’t achieve a passable level of mastery by working hard at it. 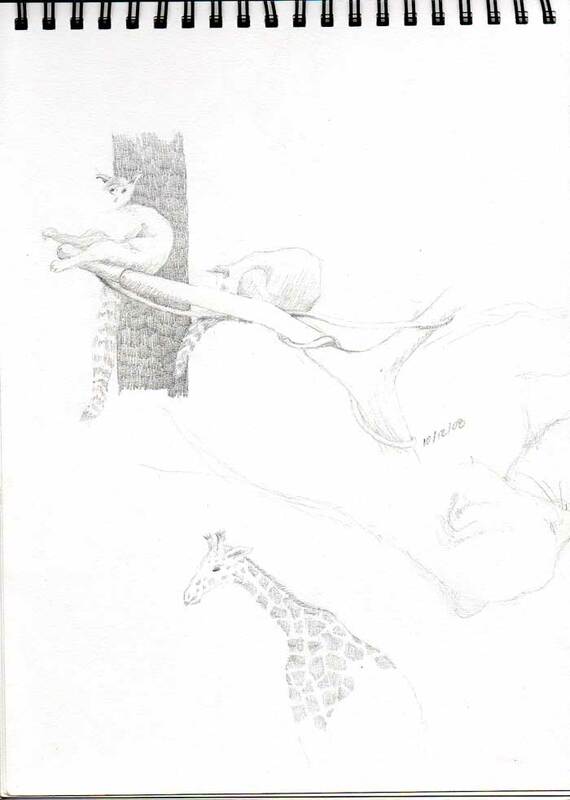 I love the “right side of the brain” books — my first introduction to journal drawing was Hannah Hinchman. ← do I get a badge for sewing on badges?